Special Offers > Special Offers > Metal Namecard Case - SPECIAL PRICES!!! 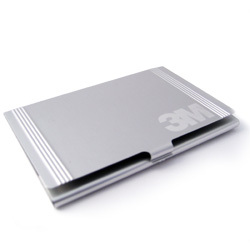 This is a stylish brushed metal namecard case which can be printed or engraved with your logo. The slim design will fit easily into a suit pocket or handbag and keeps your namecards fresh and undamaged. Suitable as a gift for motivating staff, or any corporate promotion. There is a large area which is ideal for laser engraving: 75mm x 45mm. Available at the special prices below only while stocks last. Metal Namecard Case - SPECIAL PRICES!!! Stylish brushed metal namecard case printed or engraved with your logo by BrandHK.